delicious food & our own beer. We take a lot of pride in our food & drink. Our location means that the quality of food available to us is outstanding. With great ingredients we prefer to keep it uncomplicated, local, delicious. We grow our own vegetables, brew our own beer. As with everything else, we love doing what we do outdoors. Over a fire. Our specialities are wood smoked and barbequed meats /fish, and pizzas, bread from our stonebaked oven. We will work with you to blend three key ingedients: people, produce and place and make them sing and shine. We have a range of dining options to suit most budgets using the very best seasonal produce. Choose from our seasonal menu, or work with us to create something unique incorporating the best that the land, sea and river has to offer: Welsh mountain lamb and beef, Cardigan Bay crab and lobster and salmon and sewin (sea trout) caught by the traditional coracle men of the Teifi river. The provenance of fforest food is very important to us, and whatever menu you select, you can be sure each dish will feature the real tastes and textures of our favourite local ingredients. If you have specific catering requirements in mind please get in touch and we’ll work with you to meet them. For eating the lodge Barns will accommodate up to 90 people, and our Cedar barn up to 150. Arrival Pizza supper made from the classic ingredients supplied by the Pizzatipi our very own Pizza restaurant. Arrival Tex Mex supper, freshly made on site to warm up your guests on their arrival. - Granola, fruit, boiled eggs, toast & local jams and spreads. 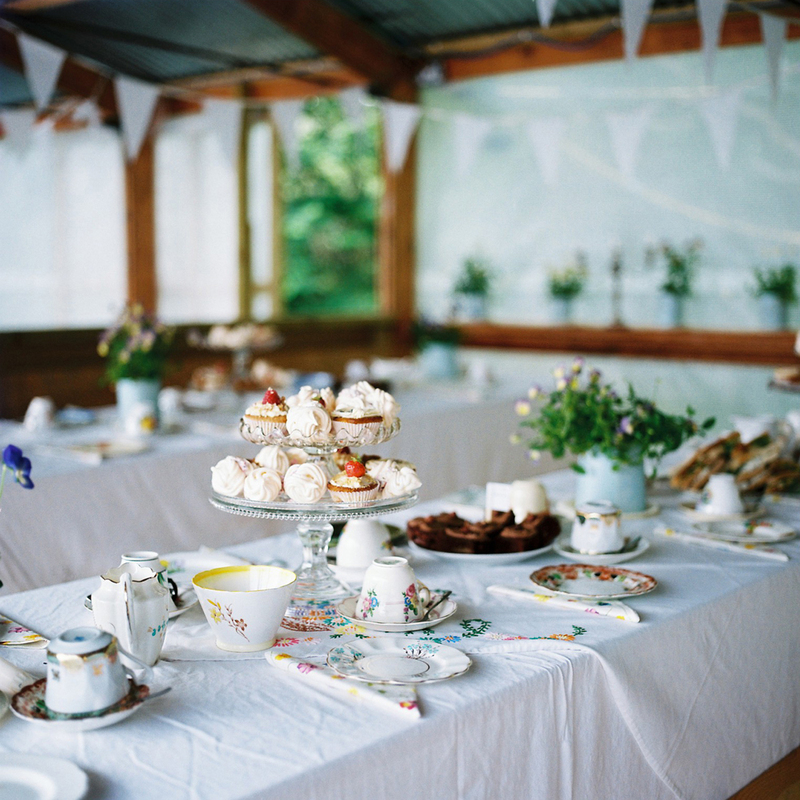 In the Barn, on long tables laid with our stock pile of vinatge crockery & stands, blooming with flowers and alight with candles, you and your guests can gather round for a fforest tea party. - Choose from a selection sandwiches, quiches, sausage rolls, scones, and lots of sweet things all made in our kitchens. See our menu for details & options. Sit down with your guests and enjoy an evening supper. Allow us to show off with meats cooked by fire served with fresh sides and salads on massive serving plates. Choose from our other delicious options. Everyones feeling great but... a little fragile. We can put on all the breakfast usual + a spread of bbq'd mushrooms, bacon, sausages, tomatoes, beans and fried eggs. Working with the best of the seasons some ingredients may change depending on availability but please see our latest menu below. Pricing is structured on a per head basis please see our menus and enquire at the bottom of the page for more exact numbers.